Leeds United have called a press conference for this afternoon at which they are expected to unveil Uwe Rosler as new head coach. Executive director Adam Pearson is set to present Neil Redfearn’s replacement to the media with Rosler expected to be the man to step into the hot seat after holding talks with owner Massimo Cellino yesterday. No announcement has yet been made on Redfearn’s future and whether he will return to his job as head of youth. Leeds had been linked with Gus Poyet and Mark Warburton over the weekend, but Rosler emerged as the favourite for the head coach job yesterday. 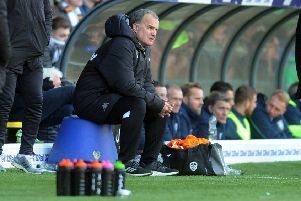 However, whoever takes over will face a tough job winning over the fans who made it clear with their support of Redfearn that they wanted him to carry on in the job. Rosler has been out of management since being sacked by Wigan Athletic in December and recently turned down the opportunity to return to Germany with 1860 Munich. Previously, the 46-year-old enjoyed success at Brentford, taking them to the brink of the promotion in 2012-13 when they lost out in the League One play-off final against Yeovil in May 2013. As a player Rosler was a big favourite with Manchester City fans.